North, south, east, west—whichever direction you head in Illinois, you can find a romantic stay at an Illinois bed and breakfast. Several are sweetening the pot with specials this winter, making them perfect for Valentine’s Day. Goldmoor Inn sits atop a bluff on the Mississippi River, looking every bit like a castle. And with luxurious accommodations, delicious gourmet dining, a soothing spa, and a pampering staff, you’ll feel like royalty too! 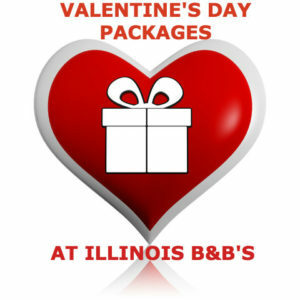 For Valentine’s Day, the Inn’s Illinois Romance Getaway Package is an ideal choice: stay any three nights, including a Tuesday, and Tuesday will be free. Add a dozen fresh-cut roses for just $55. Chocolate and Valentine’s Day are the sweetest of combos. Stay at Beall Mansion in Alton, and you and your sweetheart can indulge in the B&B’s 24-Hour “All-You-Can-Eat” Chocolate Buffet. Beall Mansion offers elegant rooms that have marble-floored baths, whirlpools for two or clawfoot tubs, lavender bath salts for soaking, and fireplaces in many rooms—all reasons that it is consistently named one of the most romantic inns in the St. Louis area. Find romance in south central Illinois with the Cupid Package at Kite Hill Vineyards. In addition to getting to spend two nights in a vineyard, you and your sweetheart will enjoy fresh flowers, chocolate-dipped strawberries, a bottle of wine with two logo wine glasses, and delicious breakfasts. If you’re hoping to do a wine tasting while you’re here, keep in mind the tasting room is only open Saturdays and Sundays in January and February. Sneak away from the city and enjoy Valentine’s Day in a relaxing country setting at Mission Oak Inn, just outside of Peoria. With 120 acres and two luxurious suites, it’s easy to tune out and tune in to each other. Choose the one- or two-night Special Occasion Package and enjoy one specialty dinner for two, chocolates, sparkling juice and two souvenir wine glasses. One night, $269; two-night, $439. If a cozy cabin is your dream romantic getaway, book a stay at one of the 10 charming cabins at Hidden Lake Winery in Aviston. With features like fireplaces, Jacuzzi tubs, and king beds, you may never want to leave. And since breakfast of muffins, cheese, sausage and fruit is provided, you won’t have to! All of these inns are members of the Illinois Bed and Breakfast Association and offer a unique lodging experience! This entry was posted in Holidays, Illinois Bed and Breakfasts, Valentine's Day and tagged Illinois Bed & Breakfasts, Romantic getaways by admin. Bookmark the permalink.